(Guest) J&C Studios O Gauge Archive Electronics & Wiring Bus bar for common connections. Topic: Bus bar for common connections. Instead of running individual 2 wire circuits throughout the layout a common bus can be used where multiple transformers can use the same feed for a common return. Thus all transformer commons can go to one feed or bus. On a PWZW that would be the U terminal. Even one lead of a DC transformer can share the common. Phasing is not an issue unless the individual transformers are put in parallel. This simplifies wiring as it eliminates the need for multiple 2 wire feeds. Instead we have 1 big feed which can be tapped from various locations on the layout. One application of this is your automobile. The metal body is used as a common so only the hot wire is required to a light bulb for example. The bulb socket can be common with the body providing a return for the circuit. The common on a car body can also be called the ground,not to be confused with earth ground. Because the body is on rubber mounts a grounding strap connects the body to the motor and battery. 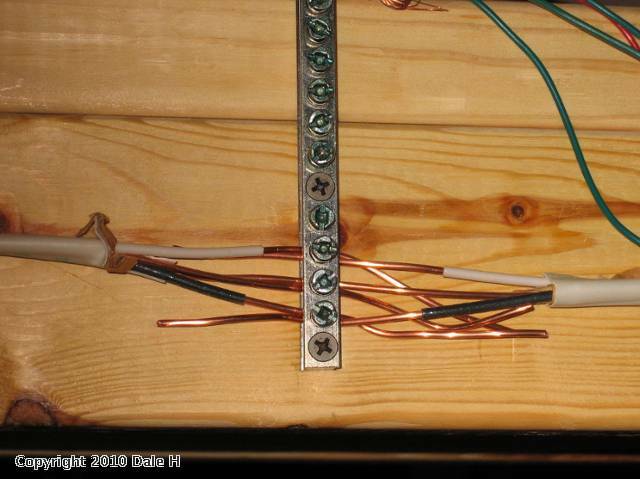 Back to trains,it is easy to make a common feed out of bus bar terminal strips called grounding bar extensions sold at home centers for various electrical service boxes. Romex can be used and connected in a loop with the bus bar for screw connections put in convenient locations along the layout. The wire bus must carry the sum of all the amperage of all the transformers hooked to it. 6 , 10 amp Lionel bricks for example would require 60 amps capacity. 3, 12 gauge wire would provide an ample return. So 12-2 Romex could be used. Stranded wire can easily be connected to the bus bar. Here is a picture of it in use. 6 Lionel bricks are hooked to it for 6 separate loops of track. The green wires are commons from the track outer rails. The bars can be cut to length as needed and screwed to the layout underneath. Hook all transformer commons to it at any point in the loop. Looping bus in a complete circle decreases resistance and voltage drop. This arrangement is not recommended for DCS track wiring. Great deal Dale ! I actually been using this technigue since the 1970's since my former HO layout. It is a great, simple and cheap way to wire. And I also use it for my accessories and lighting. You can make the lighting into "grids" like the power company for easy maintenance. They also worked inexpensively for hooking up modules on a modular style layout. A very cheap way to "bridge" them together. Whenever the hots and commons of 2 transformers are connected. For example A and U on 1 ZW and A and U on another ZW. This can happen for example if 2 adjacent blocks are powered by different transformers and are bridged by a car with 2 pickup rollers jumping the fiber pin isolating the center rail blocks via the 22 gauge wire connecting the rollers.. Some people also connect to like transformers in parallel to provide more power to a circuit. For example 2, 10 amp lionel bricks in parallel could provide 20 amps to one circuit. In command where multiple trains are run on a large loop this extra power may be needed. If doing this make sure the wiring is of sufficient gauge to carry the amperage, Just sharing a common is not an issue as far as phasing is concerned.